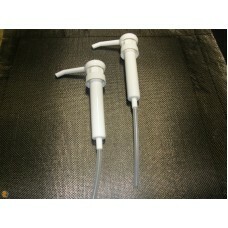 1-1 Ratio Pumps - Identical pumps, can fit either the resin or hardener side. One pump to one pump. Pumps fit all size containers from 1/2 gallon to one gallon size, the feed tube can be trimmed for use in smaller bottle. General Pump Use When Purchasing 150 Thick Resin or Kleer Kote epoxy: Although these pumps do fit our 150 Thick Epoxy Resin Systems, due to the thick viscosity of the 150 Resin and Kleer Kote Resin it can make dispensing the resin quite difficult and time consuming. It is generally better to use our graduated plastic mixing containers to properly measure and mix the 150 Thick Resin and Kleer Kote systems.